Huang Yi & KUKA is a playful & poetic two-step of man & machine that combines modern dance, multimedia, & mechanical engineering. Developing an art form requires mastery of a medium, and for dance, the medium is the entire range of possible motion that a human can produce. For Huang Yi, the innovative rising-star choreographer from Taiwan, mastering human motion is still only half of the challenge. Born from his childhood desire for a robot companion, Huang has created a pioneering partnership of humans and robots in dance. To do this, he also had to master the computer-programming vocabulary of his robot dancer, KUKA, which happens to be a massive, articulated arm-style robot frequently found in modern assembly-line duty. With Huang’s coding skills and his artistic eye, however, the typically routinized KUKA workhorse springs into a comprehensive range of motion and assumes a “personality” that becomes as curious as the mind that programmed it. Using razor-sharp precision and stunning artistry, Huang Yi & KUKA is a poignant, playful, and poetic pas de deux of man and machine that combines modern dance, multimedia, and mechanical engineering. Named by Dance Magazine as one of its “25 to Watch,” Huang has earned international accolades across Europe, Asia, and North America. Now, in a weeklong intensive and interdisciplinary residency during which Huang will work with students, the larger questions of how humans envision their future with machines will stimulate an expansive discussion about the future of life, work, and play. With the award-winning Huang Yi & KUKA as the culminating performance, limbs of muscle and metal unite in a beautiful, balletic fusion of continuous movement—forging a form of dance that flows with the fluidity of data. 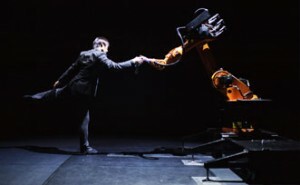 Huang Yi programs KUKA’s choreography himself, and it requires 10 hours of work to produce just one minute of the robot’s movement. A panel of Purdue faculty in robotics, engineering, and time-based arts will discuss the issues, challenges, and opportunities of human-machine interaction. Join the choreographer and artists for a discussion immediately following the performance in Loeb Playhouse. If you wish to engage your students in the residency week activities (Oct. 4-9) and/or the public performance, contact Laura Clavio at 494-9712 or lzclavio@purdue.edu.